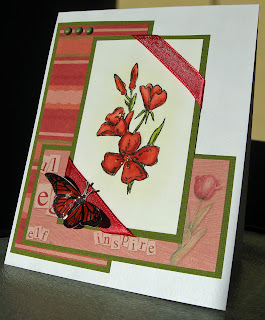 This is a card I made for a challenge I do with a group of friends over on SCS... the TSC0220 challenge, which was to case the work of the talented Darla Ryan. I loved her card like this that used the older SU! set, Natural Beauty. Hers was done in beautiful shades of pink, but I did mine a bit darker, using Ruby Red and Cameo Coral Markers for my coloring. I used Watercolor paper and a paint brush to color this image and added stickles to the centers..... love that stuff!!!! LOL! For the butterfly I used a Stampabilities stamp and after coloring it, I added Sepia by Ranger which stiffened it and gave it a real gloss. The dp is from K&Co. This is going to Australia to the victims of the horrific brush fires. A friend is heading up the effort to get cards to these people who have to be devastated, and the hope is these cards will put a smile on their faces just knowing people care and are praying for them. I have a little bundle of cards going out. It makes me happy to think they are going so far and for such a good cause. Oh, Grace, I love your butterfly! It looks real! Beautiful card. Beautiful job on this card. I really like the colors, the papers, the ribbon corners and the butterfly. Pretty much everything about this card I like! Grace (what an appropriate name). All your cards have such detail. Amazing job. What a nice gesture to send the card to Australia. Nice. I love this card and the colors. Hi, Grace! I'm so excited to be joining the blogging group, Ocean's 11. I just love all your creations and appreciate your heart so much. Will look forward to getting to know you better through all our interesting connections. Another Oceans 11 gal here! You have a wonderful blog. When I came on one of my favorite songs was playing. Usually I turn off folks players, but not yours. "I Can Only Imagine" is a favorite of mine as is Amy Grant. Anyway, I'm thrilled to see other Christians on this blogging group. I look forward to seeing more of your blog. WOW ... this is absolutely gorgeous!! LOVE that butterfly ... well done!! Just Beautiful!! Stunning card! I just love the dimension to the butterfly and the colors you chose! It will certainly give happiness to those in need of some sunshine.